Germania Executive GmbH was founded some 30 years ago. Our aircraft charter service draws on the entire European commercial fleet to meet the specific needs of customers, wherever they arise. From intercontinental jets to cabin-class twins and helicopters, Germania Executive provides unlimited options with unsurpassed service and safety. By our jets you can reach more than 1.200 destinations in Europe, non-stop. We select the most suitable aircraft from the closest location to offer the most cost-efficient solution for your flight mission, thus saving your time and your money! 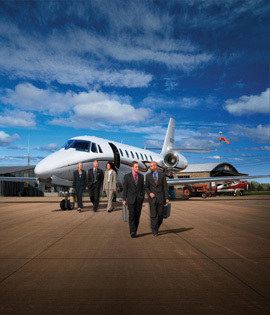 Our jets fly according to your personal schedule: No big terminals, no crowds, no waiting times. Safety controls are fast and individual. Your travel time is converted into useful time. Our comfortable, well appointed aircraft provide an ideal environment for confidential business briefings or just privacy with your family or friends.